Weiser Hall (formerly the Dennison Building), located in the heart of central campus at the University of Michigan reopened in Fall 2017 as a home to a number of interdisciplinary and internationally-focused units within the College of Literature, Science, and the Arts. They envisioned the facility as an “academic building of the future” that brings together international and interdisciplinary centers to share spaces, services, and ideas in a new kind of workplace. The University also wanted to establish a new building planning process for the campus that begins with a leadership vision and engages stakeholders creatively and strategically. The University commissioned brightspot to help prepare for the renovation Weiser Hall. Working with students, faculty, and staff at the University’s College of Literature, Science, and the Arts, brightspot led an innovative strategy development process including a study trip to a range of academic and corporate facilities, a series of workshops to discuss workplace trends and elaborate on the vision for the “workplace of the future,” and a scenario planning process to determine a programmatic direction for the building and its spaces. 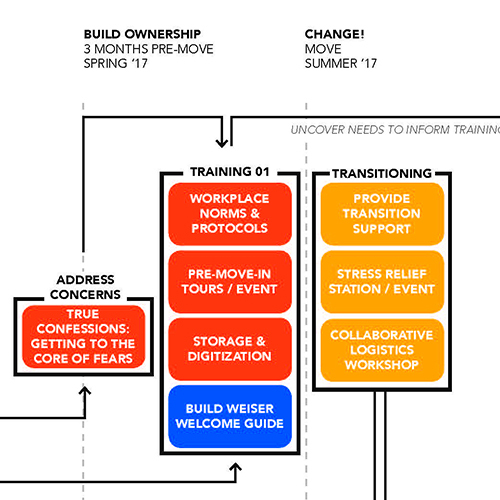 In one workshop exercise, participants used color-coded squares to create a diagram of spaces and new services on a cross-section of the building, mapping the stacking diagram and adjacencies in real-time. In parallel, brightspot also led a service design taskforce to develop the service model for the building to establish a sense of where and how activities like advising, event programming, and technology support would happen. These activities culminated in a design brief that described the vision, space needs, space allocation/configuration, and service model for the building. Strategic solutions included a ground floor service hub for the building with informal learning spaces, roving staff, and a single service point; multi-floor staff clusters across two or three floors in which units are grouped together according to function, not organization, with open assigned desks and shared meeting rooms and coffee areas; collaborative spaces distributed throughout the building; and distributed informal learning spaces and food services to support student life in the building. 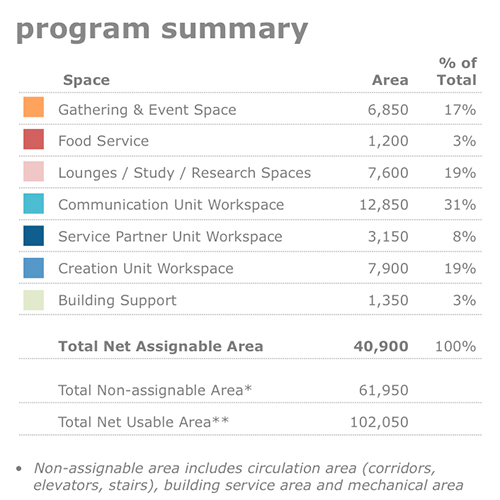 The modular, flexible workplace strategy allows for changes in academic units and their work. We piloted the strategy with some of the groups and served as strategy advisor as design and implementation began. 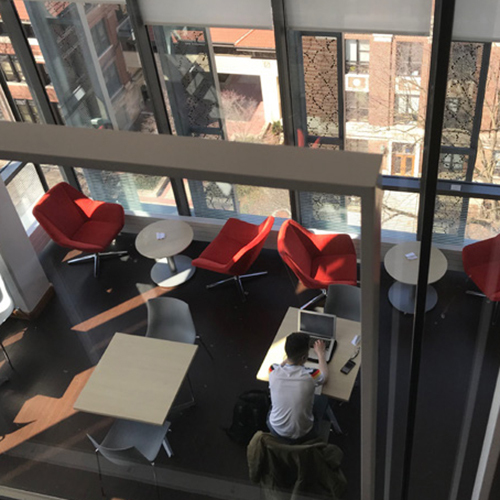 Weiser Hall opened in 2018 and brightspot’s post-occupancy evaluation revealed 75% to 80% user satisfaction with the space, technology, and services as well as significant productivity gains, saving occupants an average of 4.26 hours per week compared to their previous work environments.